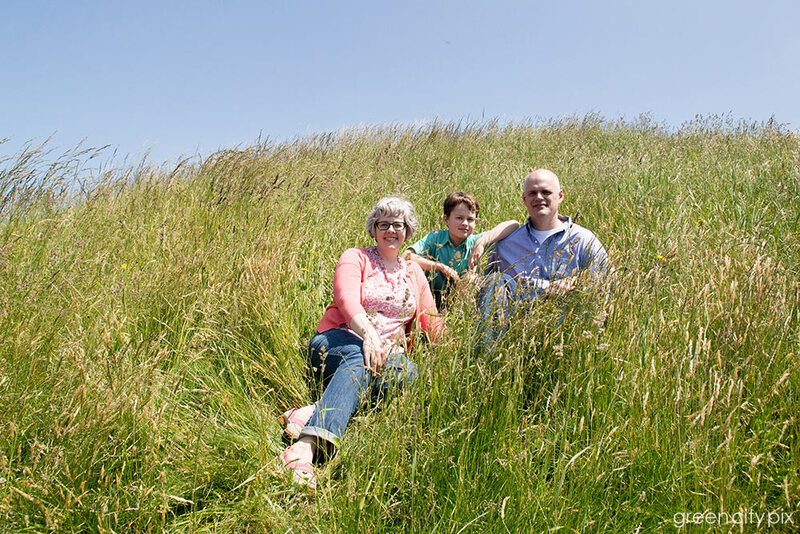 After many years of living in Seattle, my former co-worker Betsy and her family are moving to Washington, DC and wanted some photos taken at some of their favorite spots. 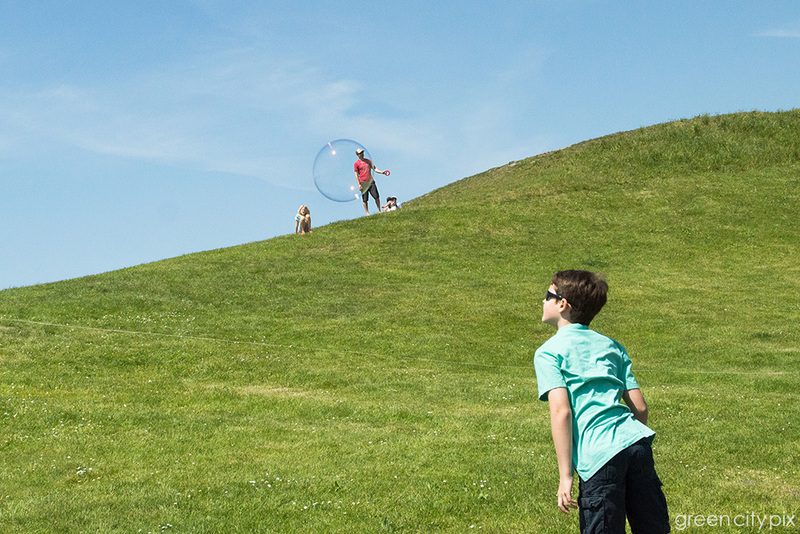 At Gasworks Park, we ran into some children blowing bubbles, and we caught some interesting moments. Large bubble at Gasworks Park. 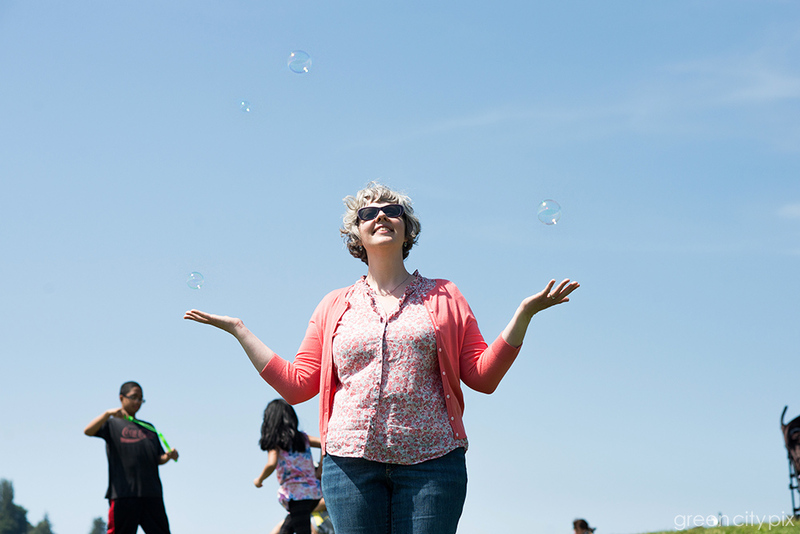 Betsy juggling bubbles at Gasworks Park. This grassy scene reminds me of Andrew Wyeth's famous painting Christina's World. Henry with parents Steven and Betsy at Gasworks. I first met Betsy when we were both working at the Fred Hutchinson Cancer Research Center. Betsy bicycles to work regularly, and I wanted to incorporate her love of bicycling into her family photos. The family is hoping to bicycle a lot in the East Coast too. When Henry was a baby, Betsy used to bicycle with him attached to a trailer in the back. He's 10 now, and clearly a little too big for a trailer or a basket, but still young enough to kid around. We ended the photo shoot at Carkeek Park, which was like going away on a beach vacation right in the city. Look at all this seaweed! As a photographer, I prefer to see people's eyes, but it was a such a bright day that sunglasses were a must. Given the dark shades, I took some shots to show that this couple had eyes only for each other. Steven makes Betsy's eyes light up. I see you, Pretty Lady!